Stereo photography consists using a camera with two lenses to take two separate images of a given subject in such a way that the two images made with the camera are displaced horizontally, one from the other, by a distance roughly equal to the distance between a person's eyes. The two images then contain the information that a person's left eye would see and the information that the right eye would see when looking at that same scene. Each eye records a slightly different image because each eye is in a different place relative to the scene. Thus, each lens of a stereo camera records a slightly different image of the same scene. The image made with the left lens is viewed with the left eye and the image made with the right lens is viewed with the right eye. When the two images are aligned properly and viewed by the appropriate eye, a stereoscopic image is interpreted by the brain just like the actual scene shot with the stereo camera and the perception of depth with near and far objects should be experienced. 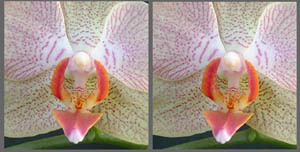 With a stereo camera the two images are taken simultaneously. The lenses for such a camera are matched in focal length and the f/stops and shutters are synchronized. The two images can also be made with a single camera, as long as the major elements in the scene are not moving, using the cha-cha method, so called because of the dance step of the same name. In the cha-cha method a picture is taken with the weight of your body mainly on one foot and then the camera is displaced horizontally approximately 2.5 to 2.75 inches for the second shot of the pair by shifting your weight to the other foot prior to taking the second exposure. Care must be taken to keep the two shooting axes parallel when moving the camera horizontally for the second shot and of not moving the camera while the exposure is being made. If, after viewing your first experiments, you feel that you need more stereo effect, simply incorporate that into your shooting style by exaggerating the cha-cha step. Surprisingly good results can be obtained using this method. Stereo photography is as old as photography itself. In fact, Sir Charles Wheatstone, in an address to the Royal Society on June 21, 1838, described his stereoscope, six months prior to the publication by Daguerre and Fox Talbot of their experiences in photography, which introduced the beginning of photography. No sooner were cameras being made than stereo cameras were being made. The Langenheim Brothers were producing stereoscopic photographs in Philadelphia, PA as early as 1852 using an unknown make of camera. The oldest known commercially available stereo camera is the Dancer, dating from about 1853, and manufactured by J.B. Dancer in Manchester, England. It produced 3-1/4" square images. The first major production of stereo cameras appeared between about 1900 and 1930. During this time period, the first camera, stereo or mono, to use 35mm film was the Homeos, a stereo camera manufactured in 1913 by Jules Richard (France). The second wave of stereo cameras made its appearance between 1947 and 1961 following the successful introduction of the Stereo Realist, invented and developed by Seton Rochwite and put on the market by the David White Company, Milwaukee, Wisconsin. An excellent source of information about all things related to stereo photography is the book The World of 3-D by Jac. G. Ferwerda, published by 3-D Book Productions, P.O. Box 19, 9530 AA Borger, The Netherlands.